Aragón Exterior (AREX), in collaboration with Aragón Alimentos and within the framework of the Aragonese Plan for Agrifood Promotion 2017-19, organized last Wednesday, April 11, the participation of two Aragonese companies in the V. Olive Oil Trade Mission in the Kingdom United, an event in which they were able to establish contact with a total of 20 British buyers. The oil of the D.O. Bajo de Granja Aragon Brunet was chosen as the best in two of the three categories of the contest held during the Mission. The mission, coordinated by TradexFirm International, consultancy based in London and specialized in the introduction of Spanish companies of the agri-food sector in the British market, brought together a total of eight Spanish companies engaged in the extraction and sale of different types of oil such as virgin olive oil, extra virgin olive oil or organic olive oil. The event was held at the The Medieval Banquet restaurant in London. On behalf of Aragón, the companies Oleazara, represented by its Commercial Director Penelope García Cruz and Granja Brunet, represented by its owner Vicente Brunet. 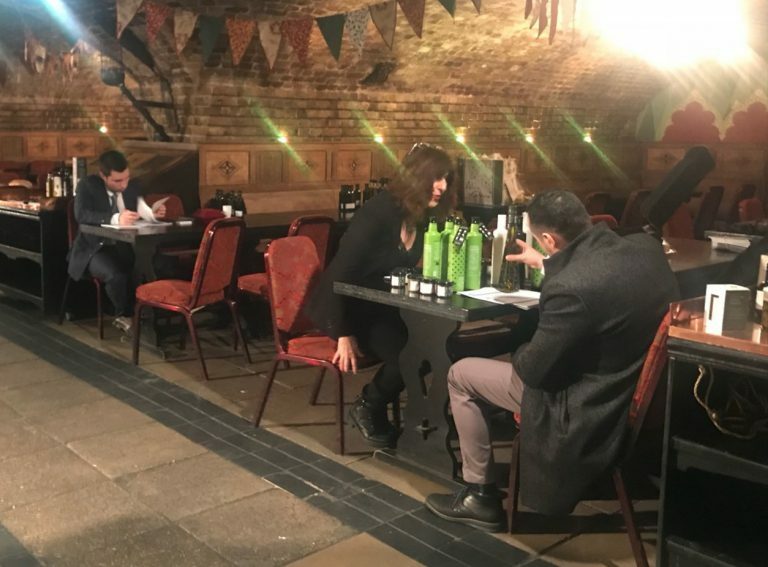 The event was attended by a total of 20 importing companies, restaurants, online gourmet products companies and distributors, all interested in a premium and high quality product such as Spanish extra virgin olive oil. During the day, importers had the opportunity to taste the oils presented and vote their favorites in three categories: Aroma Intensity, Flavor Quality and Packaging. The oil of the D.O. Bajo Aragón de Granja Brunet, a company that made its first incursion into the British market in this mission, was chosen as the best in the Aroma Intensity category, and tied for first place in the ranking with another one from the Tarragona area in the Flavor Quality category. It has been, without doubt, a very good opportunity to raise awareness of the high quality of Aragonese olive oils to British professionals in the sector. AREX continues to support the olive oil sector through the preparation of individual agendas with international buyers and commercial missions. Contact us to ask for personalized advice.